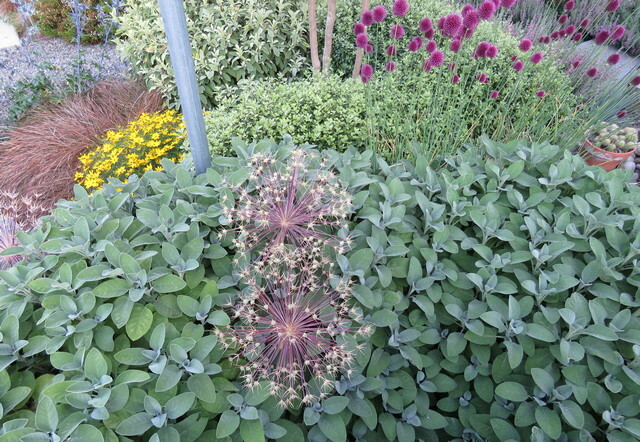 A blend of medium and fine textures, achieved using such plants as salvia, pittosporum, coreopsis, and allium. In the latest issue of the Arboretum Bulletin, garden designer Janine Anderson continues our illustrated series on garden design by explaining a key element: texture. She defines garden texture, describes the different categories of texture (fine, medium, bold), and explains the visual and tactile effects of contrasting textures in the garden. As with our other articles in the series, Janine uses lots of sumptuous photos of garden beds to show garden texture in action.